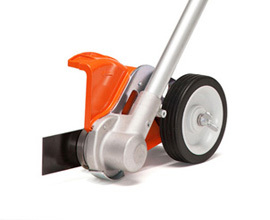 FCS-KM is a versatile straight-shaft edger attachment that gives precision to garden edging. The STIHL KombiSystem straight lawn edger attachment cleans up edges with more power; the open guard design for smoother cutting and less clogging and features a depth control wheel for greater precision. When your landscaping lines are overrun with dense growth, choose the FCS-KM straight lawn edger attachment. •Compatible with all KombiEngines •Increased power (when compared to FCB-KM) •Open guard design – increased visibility for accurate lawn edging.